Graceland Tours - Over 700,000 visitors tour Graceland Mansion each year. The only other home in the US that has more visitors is the White House. At the start of the tour, you will board a shuttle bus which takes you across the highway and up the winding driveway to the front steps of Graceland mansion. You will be able to visit the rooms in Graceland where Elvis entertained his friends. 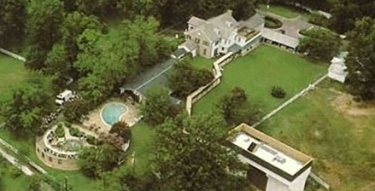 The TV room, dining room, music room, kitchen, billiard room and the jungle room where Elvis recorded several albums. The live GracelandCam updates every 60 seconds. Use your Web browser's refresh button to see the most up-to-date image. •	Upstairs at the mansion: There are several reasons that the upstairs part of the mansion if off limits to the tour. The most important is that area of the mansion was regarded as the King’s inner sanctum. This was where Elvis drew the line between his private life and the rest of the world. It is out of respect for Presley that this area remains as he would have wished. •	The upstairs area consists of Presley’s bedroom, wardrobe room, office and bathroom. Also upstairs is Lisa Marie's white and gold bedroom bath and dressing area. •	As you tour Graceland, you will use headsets to listen to the guided tour. •	In addition to touring the mansion, you can also visit other areas including the Sincerely Elvis Museum, the Elvis Presley Automobile Museum, watch the film Walk A Mile in My Shoes and take the Lisa Marie and Hound Dog Tour. •	You can purchase tickets to these attractions as packages or individually. No Flash Cameras Allowed During the tour if you want to take photos at Graceland, make sure you use film that does not require flash. Over the years the flashing began to cause the deterioration of the colors of the fabric, paintings, etc. Today flash cameras are not permitted. Graceland is open year round. During the winter months from December - February, the Mansion is closed on Tuesdays. For most of the year, the ticket office is open from 8:30am until 5:00pm Monday – Saturday and from 9:30am until 4:00pm on Sunday. Winter hours from November through February 9:30am – 4:00pm. The mansion tours start 30 minutes after the ticket office opens. The final tour of the day begins when the ticket office closes. Special Note: You may visit the gravesites of Elvis and family members in the Meditation Garden for free daily from 7:30am until 8:30am. Watch this beautiful tour of Meditation Garden where Elvis rests with his family. Elvis", "Elvis Presley" and "Graceland" are Registered Trademarks of Elvis Presley Enterprises, Inc c) 1996 E.P.E., Inc. They are under full copyright. This is an educational nostalgia website operating under Fair Use Laws. All audio, photos and music files on this site are in & from the Public domain. They are for listening and evaluation purposes only and should not be used for commercial use.